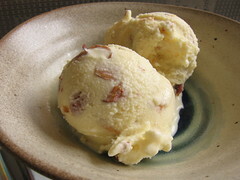 White Chocolate Ice Cream with Toasted Almonds - Do You Know The Muffin Man? Notes: An interesting note in the recipe says that it's hard to make an ice cream with a strong white chocolate flavour, as the texture often becomes grainy with the addition of too much chocolate. Their guideline is to keep the white chocolate below 15% of the total ingredients (by weight? by volume? they don't say), and just use the flavour as a background for other mix-ins. I opted to make the variation with toasted almonds, and also adjusted the cream/milk ratio to 50:50, rather than 75:25. The ice cream tastes pretty good, with a subtle white chocolate flavour, but it melted quickly. I suspect I undercooked the custard base; when my thermometer showed 185°F, it still hadn't thickened. Anyway, I found the toasted almonds to be a bit overwhelming abd halving the amount called for would have been fine.